Whenever I head north, to my first towns and counties, I love to drive Route 9 up from Poughkeepsie, or up the Taconic State Parkway. On each road there is a moment when I realize I've crossed a boundary. The line is somewhere in Rhinebeck, on Route 9, and it's where the Taconic crosses Jackson Corners Road. The house across from the quiet rush of the Roelof is just a few miles from that crossing. * North of that line is my heart's first home. For years now, when I return from the North, when I cross the state line on Interstate 85, back into this Carolina I adore, I roll down the window and holler for the joy of being where I belong. The pavement painting, the spacing of the lanes, the way the trees grow, the way the fields lay on the bones of this land, the very way the sun kisses the surface of this place all speak home to me. Once I felt stuck between the two, unwilling to return to my roots in New York's rural Hudson Valley, but my ties to this North Carolina Piedmont were not as deep as childhood. Now, on my most recent trip, to mingle with family as we laid to rest our patriarch, the first generation of three to be born in Poughkeepsie, I discovered I loved NY more, and belonged to it less. This trip I felt the hollowness of the explanations I have made to Southern friends about what I called Northern manners. Somehow the idea that the priorities are different up North, that privacy, bold honesty, and not wasting someone's time are paramount virtues in New York and New Jersey, had always seemed on a par with the Southern concepts of seeing people first, acknowledging their humanity first, then getting to the point. But this trip, perhaps because family was in the grip of that gentlest of gatherings, a funeral, the bruskness of some New York strangers, the refusal to acknowledge a passer-by on the sidewalk, struck me simply as rude. Boorish. Unwilling to take a few moments for pleasantries, courtliness, courtesy; suddenly I heard the Southern sound of those words, and I was firmly placed. I have new boundaries, and a new home in the deepest sense. My heart is no longer between; I have laid it here in Dixie. Several years ago I tried for many evenings to hear when the day birds give way to the evening sound of the wood thrush. I also tried to hear when the cicadas stop and the katydids start, to see if there is a gap between, an overlap, or a sudden change of insect guard. I was unsuccessful all that summer, and never heard either transition. Every night I would not have paid enough attention at the critical moments, and the boundaries were crossed unnoticed. I was hearing katydids and did not recall when the cicadas had stopped. Suddenly it was all wood thrushes and frogs, and no robins singing their sweet sleepy goodnights. I had not been here enough. This summer, when I have finally firmly placed my heart here, when I have lived in this house in Hillsborough almost as long as the one at Jackson Corners, I have heard the transitions many times. It has seemed effortless. The cicadas still buzz quietly as the katydids begin. The wood thrushes start their seductive calls long before the last day birds have winged to bed. Now that my heart no longer straddles the Mason and Dixon line, and I have settled myself more firmly than I have since childhood, I can hear the whole song of this chosen place. I'm home. Click here to see and hear a wood thrush. The first sounds, with the pauses between them, are typical evening song. Sounds like these are strung together like this in a long series, for an hour or so each evening. The other (less musical) sounds are for other parts of the day and other activities. Cicada sound here. Imagine this quite loud, and when one stops on one side, you notice another is already gearing up on another side. The hotter it is, the louder they are. This is the soundtrack of a Carolina day in July. Sound above is from an educational site at the University of Michigan. Katydid sound here. They also get louder and faster the warmer the night is. Sound is from a wonderful site by Thomas J. Walker (crickets and katydids) and Thomas E. Moore (cicadas). For more insect sounds, check out a site Walker and Moore reference - Songs of Insects. Sometimes we go out after dark with flashlights and walk the neighborhood in search of nocturnal insects. We walk from streetlight to streetlight, because the best things are usually in their glow. Later in the year we stand a better chance of finding cicadas on the ground, still alive, but in their last hours - fiesty and loud (the males) but you can pick them up and tell their gender and look at the incredible unique gold filigree patterns on their heads and backs. We'd also find more of the large beetles, rhinoceros and hercules, if we went later in the summer, but we did OK on this trip. The surprise was the frogs - three in all, sitting immobile and seemingly paralyzed on the pavement. Was it the warmth of the asphalt? The two tannish frogs with greenish faces (chorus frogs? about half a mile from each other) let me lift them gently and get them off the road. I was concerned cars would run over them - I'm going to feel weird driving at night, now. The pickerel frog (the one with spots) let me touch it without reaction, but as I tried to pick it up it made four or five huge leaps into the brush on the side of the road, leaving a scattering of wet spots on the road. Frog and toad defense - empty the bladder. It missed me, fortunately. We found wolf spiders, crickets, bats, large moths (including what we think was a large tiger moth, too far up a pole to be sure), blattidae (roaches and palmetto bugs), longhorn beetles (like the one on the pole in the photo here - about an inch and a half long, not counting the amazing antennae that give the group their name), click beetles, chafers (brown scarab beetles often collectively called June bugs), big predatory ground beetles (including the ferocious looking Megacephala carolina shown here), and more. It was long, and dark, and youngest son was ready to go home half way through, but some chalk roads running all the way down one of the longest cul-de-sacs helped him forget his troubles until we were most of the way home again. There were chalk houses along the way, too, and this one still had the fat piece of green chalk inside it. The katydids were nearly deafening. I have no idea why such a racket soothes my soul, but it does. I got home tired, but happy to have spent the time with my boys discovering things that most people never see. I'm going to start a color related meme (naturally). Please Comment here if you do the meme. I actually found this hard to complete - maybe it will be difficult for you, too. Tag 3 or 4 others. Include photos for at least 3 of the items below. What is your favorite thing of the following colors? Easy for me to figure out, but it's not mine to share. A Benjamin Franklin 1/2 cent stamp in the 1938 Presidential Series. I used to stare at this page of my stamp album, and at the page with the ordinary issue of 1922/23. The earlier issue had a beautiful design that to me means the peak of American stamp engraving, but the colors of the 1938 issue drove me crazy. The orange of the Franklin stamp made me sigh, and the rose color of the 2 cent Adams was wonderful, too. I can't find a photo of the stamp that comes close to the right orange. The autumn leaves of Quaking Aspen. 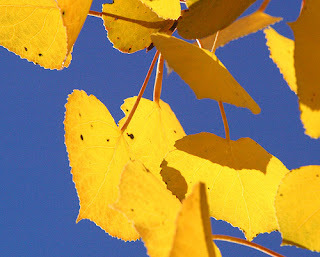 I prefer the yellow of Ginkgo leaves in autumn, but aspen leaves have all sorts of associations for me. (Photo from Flickr photostream of photoreb). I knew there was a special place that should be in this spot - but it eluded me for a while. Then, when I realized it, I felt stupid. Of course it would be where we sit on the side of the Bass Lake on the Cone Manor in Blowing Rock, NC. This photo doesn't make it look very green, but actually the grass there is green whenever we put out the same two blankets we've been carrying there for the last fifteen years or more. We realize things and put our lives back together every fall in this spot. The blue object in this photo (lower right edge) is probably my backpack, on the edge of one of the blankets. I wish we were sitting there right now. It would be my denim jacket, I think. My big winter scarf. It's wide and green (with tassels) on one end and blue (with tassels) on the other end - but the rest is made from a yarn that is a blend of colors that registers as a lively purple. BROWN: I was going to say it was my hat. My favorite photo of my hat has daughter in it - but you'll have to settle for the one above with me, my hat, and my denim jacket. 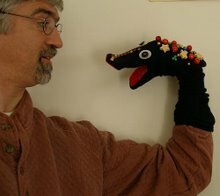 But then I realized my staff is actually more important to me than my hat. I've had several hats, but this staff has been with me since I was 19, and has inlays of bits and pieces from special places and trees. The staff is also in the photo above. Find something you own that features the entire rainbow - all the colors above in rainbow order. My art bench's left edge has a backstop for eraser chaff (it's just a length of 2x4) and on it, in a neat line, is a rainbow squad of little rubber tug boats. I found them in a big bin at a teaching type store, and secretly bought one of each color. They make me smile. We set up the card table so oldest son and I could play cribbage. We had the table up, turned our backs for two minutes, getting glasses of water to drink, and look what happens. If we put something down and it can be climbed on, it is. If it can be climbed into, it is. If it can be slept on, it is. But getting back to the game... Part of what I like about cribbage is that while there is certainly a lot of chance (as in any card game) there is also strategy, and some hands look deceptively good or bad, and then change as you analyze them. I love getting the six cards and trying to figure all the possible combinations of points before dropping two to the crib. I especially like being the dealer and calculating points for the probable crib, as well. It's my favorite card game - my father taught it to my brother and I when we were kids, but I don't think we liked it much then. Too much mental arithmetic for our age? I like the way a cribbage hand unfolds as several different games in a row, and I enjoy moving the pins around the board. It also has a pleasant jargon of its own, like most old games. The words have an English ring to them - pone, muggins, pair royale, his nobs, crib. Oldest son loves cribbage, too, and is almost always up for a game if I suggest it. Since some combinations take a while to think through, we each have something to read, and we'll look at it while the opponent puzzles over his cards. Depending on the book, this can add to the enjoyment. Calvin and Hobbes, for instance, is a good choice. Poetry is not so good (who wants to be interrupted when the crib is finally complete). This particular night he had some good hands (one played for 12 and then the crib for 13), played well, got two by muggins off me, and won in the last hand with a lead of over 15 points. I had lousy cards all evening, with only one hand that was any fun, but I enjoyed his hands almost as much as my own. A few days after this I taught youngest son (age 8) to play. He played very well, only made a few mistakes, and realized one the moment after he put down the cards. He's very sharp, good at the arithmetic involved, and loved the way the cards worked out. He could get quite excited by a hand and he had one really good one. He lost the game, but was pleased by how well he played and how the game works, and he wants to play again. I wasn't surprised. I remember reading The Call of the Wild, in an abridged version, as a young teenager. I loved and hated it. I always have a hard time reading a book that is full of cruelty to the helpless, particularly children or animals. Oliver Twist has much of one, and The Call of the Wild has the other. While the book was also filled with great beauty and wonderful characters, stirring stories and memorable friendships, I haven't read another Jack London book since. But another trip meant another long drive and the chance to hear another book. Moomin Light got me several books on tape from the library, and The Sea Wolf was one of them. I decided to see what my 46 year old mind made of Jack London. After all, Dickens (whom I also disliked as a teen) is now a favorite, with David Copperfield having a place of honor on my shelves. This was an unabridged version, and I quickly realized how much I probably missed in the abridged London I read as a teen. The Sea Wolf pits an ultimate idealist against his rational counterpart, an ultimate materialist, and wastes no time getting the reader right to the heart of the matter. That was familiar to me from The Call of the Wild, and the style was strikingly American and recognizably London's own. The powerful story contains much brutality, as you might expect on board a turn of the century seal hunting ship, owned and captained by a man with a reputation as the most monstrous skipper in the fleet, but it also contains a tender love story, and gripping debates about temptation, the soul, immortality, life, power, courage, and much more. "Wolf" Larsen, the captain, has limited all his reasoning to what he can "pick up and look at," having the courage and corruption of his convictions that life is just a "yeasty ferment, where the stronger destroy and eat the weaker." His arguments are compelling logically, and the words and the action seem to make a mockery of idealism, faith, and God. But the story blows back and forth, like the weather that is so powerfully described, and in the hearts and actions of the characters you see a different logic gradually worked out, and different conclusions drawn. 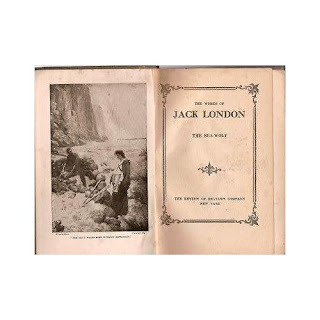 It's easy to see why this book was a best seller in the early 1900s, and made Jack London's name and career. It is full of adventure, rich in believable and complex characters, is told in a voice all his own, and has a symmetry that is deeply satisfying. I may be unable to totally suspend my disbelief in all that Humphrey Van Weyden manages to learn and do by the end - I think Mr. London lays it on a bit too thick, how completely made over is the 98 pound weakling from the start of the story - but I can easily forgive that flaw for the rest of the story, and for all the unforgettable characters. I love bee balm blooms, which remind me of wild bergamot (the oil of which gives the fragrant character to Earl Grey tea). Even more, I love the wasps, beetles and buzzing creatures they attract. Especially these we call bumble bees. In the second shot I caught one in flight (lower right). Actually true bumble bees are smaller and have more fur than these. These are more likely to be digger bees (I once saw a stream bank full of hundreds of holes and dozens of digger bees coming and going, one to each hole), or some other group of apidae. But we just call them all bumble bees - fat black and yellow solitaries, not honey bees, not wasps. I have tried in vain to identify the species we have in our yard each summer - the field guides in common circulation aren't detailed enough, and it's almost impossible to identify these insects without killing them, which we will not do. Some are carpenter bees, which make perfectly round bores into fence posts, wood trim on houses, wood furniture, etc. to lay their eggs. If you see a big, black tailed bee hovering around the wooden trim of your house or deck, right up next to the wood, it is one of these. And I believe they can measure the depth or quality of the wood sonically by hovering... Nature is incredible, and the insect world includes creatures far weirder than aliens in science fiction. This is a quite Catholic post. Though I've been standing out in a pasture now for months, I'm still a Catholic cow, and when I eventually wander indoors again it will likely be because of the Eucharist. We are partly physical beings, and so God speaks to us with physical things. He also stirs us to remember and to pray by using certain physical things. Certain kinds of physical reminders the Catholic church calls sacramentals. The list of these is long - kneeling at prayer, the sign of the cross, bells, church buildings, incense, stained glass windows, icons, statues, candles, ritual foot washing. Rosary beads are another reminder, and a tool to help us meditate on the miracles of the New Testament. Protestant friends have a hard time understanding the Rosary, but it's really just an old, tried and true, method for concentration on the life, death, resurrection, and next coming of Jesus, and for asking a fellow Christian (Mary, the Mother of God) to pray for us. The hands are busy with the beads, the mouth (and left brain) is busy with the Biblical words of the angel and the prophet (Elizabeth), and the rest of you is free to get closer to Jesus. Years ago I made my own large beads, with special symbolism (it's all about reminders), and had them blessed by a priest after daily Mass, which I used to attend regularly for a while when work was near a Catholic church. I have used the prayers to weather difficult times, and to celebrate good times. So things like these can help us focus our wandering minds and hearts. That's what sacramentals are for. Nearly every faith on earth has their version of this - objects, gestures, rituals, words, which help us focus the "monkey mind," as Buddhists call it. I daresay we surround ourselves with these reminders. We grow up with certain things, and those can often reach the deepest within us. Back in the first few years of our marriage (about 25 years ago now) I made dear wife a label for a jar of bath salts. She used them over the next few winters, and cleaned and saved the jar. Years later, after we became Roman Catholics, a good friend went to Lourdes and brought back healing water from the grotto for friends. I recall sprinkling it about the house and praying God would bless our family's space, and then we put the rest in this jar and put it in the fridge. It has been there for years, reminding us by its presence, that God is nearer than we remember, and that He acts through all sorts of people and events. Through Mary, for instance, and through the faith of thousands who have made pilgrimages to a grotto in France. And it is a reminder that we do not pray alone - we pray with the vast communion of the saints, all those with us now, and all those who have gone before us. And as we ask friends and loved ones to pray for us here, we also may ask those who have gone before. I drove to Nashville, TN this week - about eight and a half hours over Interstates 40, 74, 77, 81, and 40 again. I had a blow out (my first) on I-81, climbing a long hill in Tennessee between Bristol and Knoxville. I changed the tire in under 20 minutes (that's what doing your own rotations does - six tire changes to rotate with a scissor jack) and was back up to 70 MPH, blessing my local Hillsborough tire merchant (Braxton's) for persuading me about four years ago to replace my silly donut spare with a real tire. But while I was changing that tire I was actually busy thinking about the Captain, "Jim," and mostly, who is the Enemy. I never came to a conclusion on that last question, though I have several pet theories. 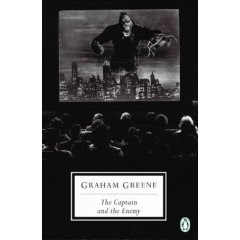 Graham Greene's The Captain and the Enemy was read for me (on tape) by Kenneth Branagh, who did his usual masterful job. The personalities of the Captain, "the Devil," Liza, Quiggly, and "Jim" are all subtly and intelligently portrayed in dialogue that sweeps you away in the first few pages. The Captain is so deliciously slippery and likable - like the most charming con-men encountered anywhere in literature. The premise is that the Captain wins the boy (aged 12) from his father in a game of backgammon, gets a note from the father to take the boy out of boarding school for the day, and heads with him for London, where Liza has always wanted a child... Since the boy was miserable in school (how many fictional boys in boarding school aren't?) it all seems like a holiday, a reprieve, a stay of execution. But this is only the beginning, as an unusual and touching love story unfolds in the most unlikely settings. The characters are few, but unforgettable, like Dickens characters brought up to date. And because it is Graham Greene, the last chapters take place in Latin America, with politics and the shifting lights and shadows of the jungle. A beautiful, moving work, which will have you thinking deeply about love, and trying to decide who or what is the Enemy. Let me know what you think. The mug is one Moomin Light and I got years ago - before kids. We have this one and a brown rabbit in similar pattern. They were called "Minimal Mugs." I can't find a thing about them on the Internet. * Table cloths from Provence - we bought ours year after year at the shop de Provence et d’ailleurs in Blowing Rock, NC. ** "Now is the winter of our discontent / made glorious summer by this sun of York" - famous opening lines introducing us to the character of Richard III in Shakespeare's play. The Duke of Gloucester speaks them (about Richard - the last king from the house of York). 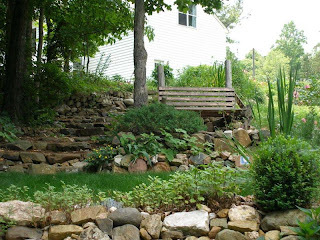 I've written elsewhere about how I love making stone walls. The last long flowerbed I built has the best walls, and it's out in all day sun, where the whitetails hunt. I don't mean deer - I mean the dragonflies. They love to settle on a stone in the heat, and every few minutes they fly up for a quick looped reconnaissance, then land again on the stone. We've had at least three in the yard every year now for as long as I've had stones in the sun. Older males have an all white abdomen, like the upper right photo in the composite above (taken in our gardens). The others were in the flower bed, on various stones, and might be females or immature males. Two more were on the long stone and earth steps that I built years ago going down the hill (photo), including a smaller male with a white tail. I was taking the photos of the live dragonflies when I noticed that this was the bed where oldest son placed his dragonfly sculpture this year (lower right of the composite photo). We bought it for Christmas or his birthday one year, and he places it every spring, along with the other creatures. That lily I posted about earlier? The one that took over a month to fatten up and position its buds? Well it bloomed a while ago. I was waiting for Moomin Light to post about them first - they are her lilies (she has babied them to the glorious state they're in now) - but she told me to go ahead. So here's the results. And they are glorious. These blooms are each about nine inches across, and it has a sweet fragrance that you can smell a good distance all around it. I have business meetings in TN this week, including one in Nashville. I was intrigued, on leaving the restaurant tonight, to see this down a long avenue in a large park. It turns out to be the only replica of the Parthenon in the world. I read that on a bronze plaque, after I walked in the dark, serenaded by katydids who only sang two syllables of their song (they sing three most of the time in NC), and then all around and among the large pillars. 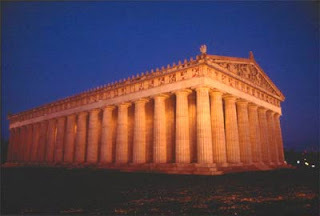 Read about the Nashville Parthenon here. And about the Athens original here. The original was designed in line with the Golden Mean, a proportion concept that has dominated much of Western art for millenia - apparently long before it was named and described in the Renaissance. It is approximately 3x5 (1.61) and it can be seen in numerous virtual rectangles all over the structure, from the rectangle of the facade, to the rectangle made from any three pillars in a row, to small rectangles in the ornamentation. The replica was built on this spot in Nashville out of temporary materials, first, for a huge expo in the 1800s. It was such a huge hit that they built it again in more permanent materials. I was impressed, walking around it, lit beautifully in the dark. It appears to be made of cast concrete pieces, with lots of stone in the mix. The effect is probably more durable than the original, if not quite as lovely in texture and color. I noticed that, like the original, the corner pillars are slightly closer to their neighbors - this was deliberately done by the Greek architect(s) to give the corner columns more visual weight, because without a neighbor on the other side, if spaced the same, they would look a little weak. This lily has been showing buds for over a month now - and every day I think they are fat enough to bloom in a day or two. A week later they are still fatter and still not open. Here they finally look like they might open. I will post a photo of the show, when it's finally on. I'll wait until Moomin Light posts about it, though. These are hers. As I recall they are pretty amazing - worth the wait. The buds are at eye level - it's a big plant. *From The Little Prince. Our copy has note in the front - it was given to my father in 1955, by a teacher who shared it with him when he was a teenager. The first few chapters have some very important advice for artists. What in the world is dear wife reading now?! (She reads so omnivorously that I consider most people's tastes pretty narrow in comparison.) I picked up this book (different edition and cover in our case - from one of the three libraries who store a measurable percentage of their books in our house - late fees? we should be charging them rent) and opened it at random to get a taste. Weird stuff, very British, very girly, diary format. I read for twenty pages or so and put it down. "So are you going to watch the movie with me?" asked dear wife a day later. 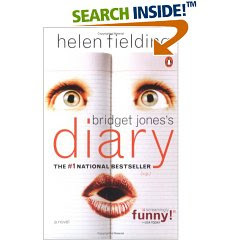 "Bridget Jones's Diary" (she meant a DVD from Netflix). "It's weird, and I didn't like any of the characters. I don't think I really want to know what else they get into. I read some of the stuff with Daniel, and that's enough for me." It turns out Daniel is played by Hugh Grant in the movie. Not my favorite. But a day later dear wife had finished the book and was even more set on seeing the movie (starring Renee Zellweger - who's face appears on the copy of the book that's been in our house). I picked up the book again later that day and read another thirty or forty pages. I began to get into the main character's head, and actually understood her ups and downs, her various delusions and emotional binges. Actually I'm kind-of like her at times, and I found this funny, weird, alarming, and disarming all at once. And then I had to see how it turns out. I mean I never had much doubt after about the half-way mark, but I needed to read the details. It's satisfying, to me, to know that things will turn out as they ought (so I'm not in suspense or worried about anyone) but to have no idea how anyone will get there. By the end I was just having fun, and enjoying the bizarre characters very much. The diary format and headings on each entry work incredibly well, and are quite funny and endearing by the end. I really was rooting for Bridge, and loving her friends (especially Tom, who is one of the girls, really) even as I kept rolling my eyes at each dizzy headed idea gone haywire. How can she hold onto so many nutty notions? A few weekends ago I took youngest son and his best friend to the Museum of Life and Science in Durham. We have been members for many years. My favorite place in the museum is the butterfly house. I could stay in there (or in the aviary at the NC Zoo - Flickr photos) for hours, even in the heat and humidity. 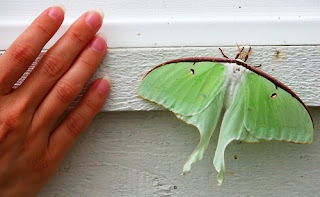 These photos show the owl butterfly, which the friend very much wanted to find, and a blue morpho that delicately stepped into his hands from another child who had been carrying it. Then on to the noise and romping of the terrific playground. Even though I don't like noise (I unplug the toaster oven before it gets to beep) I got in the act, and let youngest son wield the camera. Several structures were quickly turned into bases, which this tunnel joined, and other kids, like the third boy in one photo, were enlisted by the friend (who has never met a stranger) to join their team. The object was to sneak or run around without being seen by the girls. A friend from work has gone into business for herself, doing book keeping and accounting for a number of environmental firms in Pittsboro. Her new business cards say "Green Bean Counter." I wish her good fortune - she's made her own luck by working hard and gradually taking on these clients outside of her day job. She is very into pink and pigs. She doesn't eat pork or beef - and she raises pigs as pets (Vietnamese potbellies). My children, if we dropped by my office off hours, would ask if we could go look at the office of "the pig lady." When I was just starting to paint again I did one of my first watercolors for her - I called it Pigland. Over a year later, it turns out her new office in Pittsboro is painted in pink (two walls) purple (on wall) and yellow (one wall). Her window looks out over a parklike area where she sees rabbits playing. 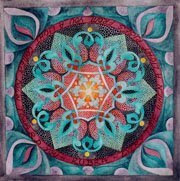 She is going to decorate with original artwork, including this piece of mine. So my first excuse to go see her in her new quarters (about 40 minutes from our office - but a lot closer to her home) will be when she gets this painting up. It's great to have my pictures gradually hanging all over the Triangle. 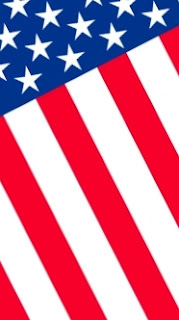 This is my 100th blog post and it lands on Independence Day. A day of interesting predictions and coincidences. On this day in 1776, of course, the official signing of the Declaration of Independence, an act of courage (because it was treason), was completed in what is now called Independence Hall in Philadelphia. The vote for independence, and accepting the document, was taken the day before, but this was the day of ceremony. John Adams wrote his regular letter to his wife Abigail, and poured more than the usual emotion into it. He said, "I believe that it will be celebrated by succeeding generations as the great anniversary festival. It ought to be celebrated by pomp and parade, with shows, games, sports, guns, bells, bonfires, and illuminations from one end of this continent to the other..." (I'm sure he meant to add something about the terrific food.) And while it was years until big annual celebrations, and until fireworks became the very symbol of this holiday, he was right. Looking forward, with the probable long years of war, squabbling over the Constitution (which wouldn't be written for over a decade yet), and possible loss and hangings for all the signers, Adams could only see the best possible future. He even seemed to foresee our nation stretching from coast to coast. Fifty years later, on July 4th, two of the men on the small committee that worked on the Declaration of Independence passed away mere hours apart. John Adams and Thomas Jefferson, after breaking their friendship over politics (Adams was a Federalist, Jefferson a Democrat), after reestablishing that friendship in their old age and writing a famous correspondence, died on the same day, as the nation, 50 years old, was celebrating around them. The news of the passing of the two great men was taken by many as an omen, and many believed these elder statesmen, who had watched over the country's early years and lived so long, had held on until this day as a sign that they would somehow continue to watch over it after death.